"We'll never make it at this rate!" Living in the Detroit metropolitan area, each August I find myself exposed to car culture at its most extreme in an event called the Woodward Dream Cruise. Woodward is the major road in city lore, and each year gearheads pull their classic cars out of the garage and parade them up and down Woodward. This is mainly intended to take place on one Saturday each August, but instead has grown to where people set up lawn chairs along Woodward, even on weeknights, three or more weeks ahead of the main cruise, just to watch traffic go by. Think about that � there are people who will willingly sit and watch traffic! The big cruise itself is so bloated with traffic that one can literally travel faster on foot than in the cars driving on Woodward. And people happily do this all day long, both to drive these vehicles and to watch them. It is mindboggling, but then I find cars largely boring beyond their utilitarian purposes, so I am clearly not the target audience. All that said, I was ready to see Jacques Tati give the automobile a proper needling in Trafic, his 1971 follow-up to the immense Playtime. Just about anything would suffer by comparison, but Trafic comes as a disappointment even when viewed at a distance from Tati's masterpiece. 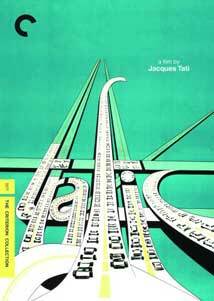 Where Playtime saw Tati take on architecture and modern city living, Trafic looks at cars and their effect on us, but the film is so tame and generally limp that little impression is made. The basic plot involves Tati's filmic alter ego Hulot, as he tries to get his camper car from Paris to a car show in Amsterdam. The company making the car cheaps out on the transportation, sending Hulot and his vehicle in a rickety truck that continually breaks down, and they saddle him with an American public relations woman (Maria Kimberly) who remains blissfully free of tact and subtlety in doing her job, which further complicates their trip. While the auto show rolls on without them, the travelers have a series of encounters on the road. Given the impact of cars on the world, it seems odd that Tati has so little of interest to say about the topic. Tati shows us that cars enable us to sometimes go nowhere fast, as plenty of comically frustrating stop and go traffic is seen, and he notes that people do things in cars without paying much attention to the fact that other people might be watching, as a nose-picking montage illustrates. Are either of these observations especially new to anyone? I doubt it. It is mainly city traffic that Tati focuses on, as the highways see cars flying by, a heavenly scene to many big city drivers. In the city, Tati gives us cars locked into what look like permanently knotted patterns, their inhabitants sentenced to their fate, particularly in the grim and rainy end sequence. Even a carefully choreographed multi-car accident comes off as flat, though some of that is simply victim of the sedate pace at which it occurs. Years of Hollywood car sequences render this one toothless and rather sad, though it's no fault of the film itself. It�s the gentlest multi-car pileup I�ve ever seen. One of the differences in this film to previous Tati films is the role of Hulot; previously, Hulot simply experienced the world, or had it forced upon him by circumstance and society. Here, he's much more active, with his invention of the ridiculous camper car. Hulot is relegated to mainly striding around, ineffectually trying to get things moving. It�s a disconcerting change. By the end of the film, we�ve traveled nowhere, and done so in a fairly tedious fashion. Out of all Tati�s Hulot films, this was the least comedically successful for me; I chuckled a couple times, and that was that. It looks good, and the sound work is attended to with Tati�s usual care, but it just doesn�t go anywhere - much like the Woodward Dream Cruise. Image Transfer Review: The transfer presents the film in its original full frame ratio, and it looks pretty fine, with a generally clean transfer. There has been online discussion of the color palette and its relative correctness, but not having seen the film in years (and only then on a dodgy VHS copy), I can't comment as to the correctness of Criterion's transfer. I thought it suited the picture, personally. Audio Transfer Review: The soundtrack is in a mix of English, French, and Dutch and is presented in the original mono format. It's perfectly fine, all things considered. Extras Review: On disc one, he extras begin with an episode of the French series Morceaux de bravoure (00h:14m:23s), in which Tati is interviewed about his work. An excerpt from Le journal du cinema (00h:07m:22s) features several of the cast, who discuss the film and working with Tati. The trailer wraps up disc one's materials. Disc two features the real extra of interest, Sophie Tatischeff's (Tati's daughter) documentary In the Footsteps of M. Hulot (Part 1: 00h:51m:16s; Part 2: 00h:51m:58s), which looks at her father's life through the prism of M. Hulot. It's a fascinating and must-see film for fans of Tati and includes plenty of archival an film footage. Even if you don't like Trafic, this makes up for it. Far from Tati's best, Trafic stands to this reviewer as a disappointment in the director's career, though Criterion's two-disc package will be a must for Tati fans, given the excellent extras.